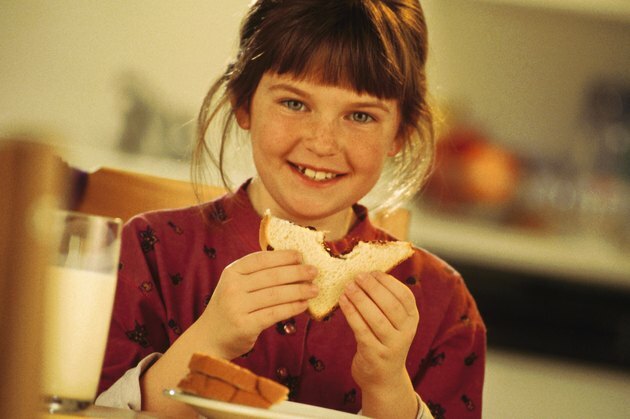 A peanut allergy is one of the most common types of food allergies, especially among children. Someone with a peanut allergy has a hypersensitivity to the proteins found in peanuts and can lead to mild or severe reactions, according to MayoClinc.com. Some of the most common peanut butter allergy symptoms are nasal congestion, digestive difficulty and skin rashes. If you notice that you experience adverse reactions to peanut butter when you ingest it, contact your doctor immediately for an evaluation. When you have an allergic reaction after eating peanut butter, your body overreacts to the proteins found in peanuts. Instead of reacting to the proteins as safe, the immune system instead treats the proteins as if they were harmful to the body, according to Kids Health. This mistake causes various chemical reactions, such as the production of antibodies and histamine. Histamine is the chemical in the body that leads to inflammation and irritation in soft tissue. The main allergic rashes from a peanut allergy are eczema, hives and general itching and redness. Hives form within a few minutes after eating peanut butter. Hives can form anywhere on the body and appear as elevated and red clusters of welts that are extremely itchy, according to the American Academy of Allergy, Asthma and Immunology. Eczema is an allergic skin rash that forms small blisters that can weep and crust over. Eczema also creates patches of skin that are leathery and itchy. Other symptoms of an allergic reaction to peanut butter include sneezing, diarrhea, nasal congestion, cramping, vomiting and asthma, according to MayoClinc.com. Asthma symptoms will develop symptoms, such as wheezing, coughing, difficulty breathing, shortness of breathe and chest pain. Nasal congestion can lead to sinus pressure pain throughout the face and postnasal drip. One of the first signs of anaphylaxis is hives, accompanied by other symptoms. Anaphylaxis is a severe, all-body allergic reaction that can lead to death. Anaphylactic shock causes extreme levels of histamine throughout the body to increase, leading to a state of shock. Other symptoms along with hives are dizziness, anxiety, a drop in blood pressure and an increased heart rate, according to MedlinePlus. If you experience these symptoms, call 911 immediately. Treat allergic skin conditions by taking an oral antihistamine and use topical hydrocortisone creams. Antihistamines and topical hydrocortisone creams will reduce the inflammation and itchiness of in the skin, according to the American Academy of Allergy, Asthma and Immunology.